Moscow sushi bar Sayori sashimi at Misato. These days it’s easier to find sushi than borsch in Moscow, here are our top five. Warning: some come with a hefty price tag. Words by Tatyana Leonov. This is the place for Moscow’s sushi connoisseurs. It’s expensive (most dishes cost more than $32), it’s swish (windows are fish-filled aquariums), and it’s huge – a whole three levels with VIP and karaoke rooms. 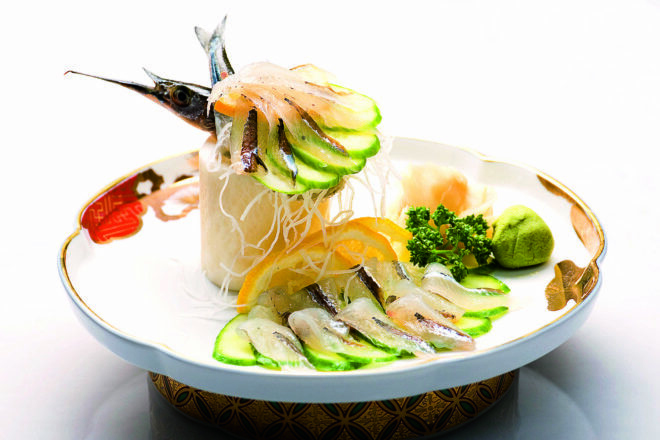 Dish to try: Sashimi – choose the location of your fish – Scottish, Spanish and Canadian…The Japanese sayori is worth trying. Head towards Laluna and you’ll bypass crumbling building facades. So the sophisticated interior is a nice surprise, and the outdoor patio a great spot to spend sunny afternoons. The hot rolls are the thing to try here, washed down with sake. Dish to try: Turbot fish with caviar sauce. One of the oldest Japanese chains in Moscow, the first Yakotorya sushi bar opened in 1999 when sushi was very new to Moscavites – and this is where many of the socialites came and learned how to use chopsticks and got to know their wasabi from their ginger. Dish to try: The Yakotorya roll – Norwegian salmon and tuna with omelette, lettuce, caviar (the Russian touch) and crab meat. The mix works! Tanuki is a Japanese racoon dog. Luckily the name of the enormous chain has nothing to do with the quirky cartoon character. The menu is extensive and incorporates some interesting fusion dishes. Kids’ options plus a home delivery service are nice added extras. Dish to try: Italian roll, just because it’s weird and not at all Japanese (or even Italian). The roll comes with Gouda, Cheddar and soft cream cheese – and rice thank God. The restaurant (there are branches all over the world including ones in Melbourne and Perth) — a union between Robert De Niro and chef Nobu Matsuhisa — became legendary in Moscow a long time before its arrival in 2009. Fitted with dark wood and burnished gold light fixtures, it’s located in one of the most luxurious areas of Moscow – with prices to match. Dish to try: Live sturgeon jalapeno. It’s alive, chilli and odd, but great!